We have over 25 years experience in high end printed graphics and portable exhibition stands, trade show banners and displays. With 4 wide format print machines in house we combine our high quality printing, knowledge and reliability to give you a supplier that is not only competitive on price but also one you can trust. 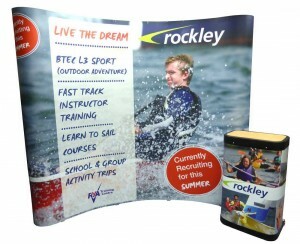 At RGL we only sell easy to install portable exhibition stands with the very best quality printed graphics. Due to ease of use, low cost and overall wow factor our pop up stands really impress ! For smaller display stands we have a large selection of roller banners of all sizes and prices to fit any budget. Roller Banners – from £45+vat. 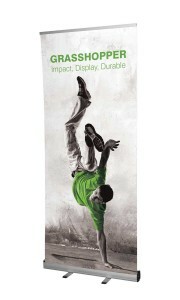 Grasshopper Roller Banners – only £79+vat. Easy Roll Banners – Mid Range Banners. 3×2 Exhibition Stands – from £390+vat. 3×3 Exhibition Kits – from £450+vat. 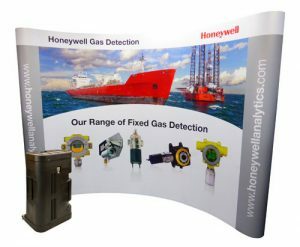 3×4 Exhibition Displays from £589+vat. 3×5 Exhibition Pop Ups from £759+vat. All our exhibition stands are designed to be easily transported and assembled without requiring any previous experience of exhibition builds. So if you are looking for a display stand that will fit within your car and can be assembled within minutes, then look no further. In view of the fact that budgets are constantly being squeezed by companies on their marketing and exhibiting. We believe that whilst price is important it shouldn’t mean compromising on quality or service. For this reason RGL we have not one, but four high quality inkjet printers and laminating in house. This gives us both reliability and the highest quality printed graphics for a whole range exhibition displays. This in turn provides you with a supplier you can rely upon to provide outstanding quality of product and service. We also believe that whilst having high quality printers is necessary these wouldn’t be of much use without experienced operators. In addition to this we have friendly staff who understand print and design software inside out. At RGL Displays we encapsulate all of these requirements together and more. Such as excellent client communication and dedication to perfection. This ensures that buying exhibition stands from us is the right choice all round and not one made on budget alone. Grasshopper roller banners remain one of our most popular displays stands being used at small events. They are simple to use and combine both quality and cost effectiveness which is why we recommend them and sell more of these than any other roller banner. Find out more about Grasshopper exhibition stands. A particularly stylish looking modular display stand with a choice of coloured branding. Not to mention the colour matching optional extras to give your stand a highly professional look. Find out more about Modular exhibition stands. Indeed the most popular of all the curved exhibition stands has to be the 3×3 pop up stand. These exhibition displays have been sold for decades and yet they are still as popular as ever. Maybe due to their ease of use combined with exceptional wow factor and of course the price ! Find out more about pop up exhibition stands. While price is so often the key factor when ordering roller banners for exhibitions. We would highly recommend the Barracuda banner due to its ease of use, longevity and overall appearance. Yes these roller banners do cost more than cheaper budget banners but if you are looking for a much better banner then these are about as good as it gets. 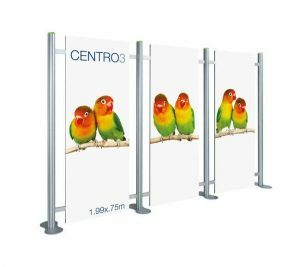 We sell these banners in 3 widths of 80cm, 1m and 1.2m wide and they all come with a photo quality, grey back graphic and scratch resistant matt laminate. Find out more about Barracuda roller banners.